With the opening of its first stores in Texas, GoldMax USA offers residents of Arlington and Richardson and the surrounding neighborhoods the opportunity to have their unwanted gold and silver items evaluated for free. Robin Leach, former host of the Lifestyles of the Rich and Famous, is the spokesperson for GoldMax, has been instrumental in the success of the GoldMax campaign, "Turn your jewelry box into your own personal ATM at GoldMax." GoldMax expects to open more stores in the Dallas–Fort Worth metropolitan area within next 30 to 60 days. 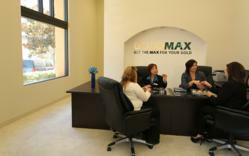 GoldMax USA provides free evaluations, no obligation quote, within a comfortable, high class setting. The woman called her boyfriend and told him that they had won the “gold lotto” and they are going on a cruise! With Robin Leach, former host of Lifestyles of the Rich and Famous as its spokesperson,GoldMax USA, the largest chain of stores specializing in buying gold and precious metals from consumers in the U.S., expects to pump more than $100 million into the local U.S. economy this year by offering consumers the opportunity to cash in on the escalating prices of gold and silver. With more than 200 stores in operation from coast to coast, GoldMax is celebrating its debut in Texas with the opening of two stores in the Dallas–Fort Worth metropolitan area. On March 9, GoldMax opened a store in Arlington at 3601 S. Cooper Street and in Richardson at 2193 E. Buckingham Rd., and has plans to open stores in Plano and Colleyville within the next 30 to 60 days. By year-end, GoldMax wants to open as many as 100 new stores in the U.S., including approximately 30 stores in the Dallas metro area. "There are lots of new cash for gold stores popping up, but the GoldMax brand is different," Garber said. "GoldMax is nothing like the average pawnshop – instead, customers can come in for a free, no obligation quote, within a comfortable, high class setting – and, if they’re ready to sell, they can do so right on the spot." Recently in Arlington Heights, Illinois, a woman in her 40s came in with a large bag of costume jewelry. According to Janice Tassone, the GoldMax USA buyer, the woman told her that she and her boyfriend as a hobby spent weekends "garage-sailing" in Huntley and this was the last bag in her car.” Within that bag of junk costume jewelry, there was a small velvet bag with the ugliest, discolored, unmarked, chunky jewelry. When Janice informed the woman that this small velvet bag was worth $4,000, the woman shot out of her chair like a bullet almost touching the ceiling tiles screaming, stated Janice. The other customers in the store joined the excitement while the woman called her boyfriend and told him that they had won the “gold lotto” and they are going on a cruise! GoldMax has built a solid reputation for paying fair market value for gold, jewelry and other collectibles. GoldMax will purchase gold (any karat), silver, platinum, necklaces, bracelets, rings, earrings, charms, watches, broken jewelry, coins, sterling silver flatware, tea sets, and candlesticks.